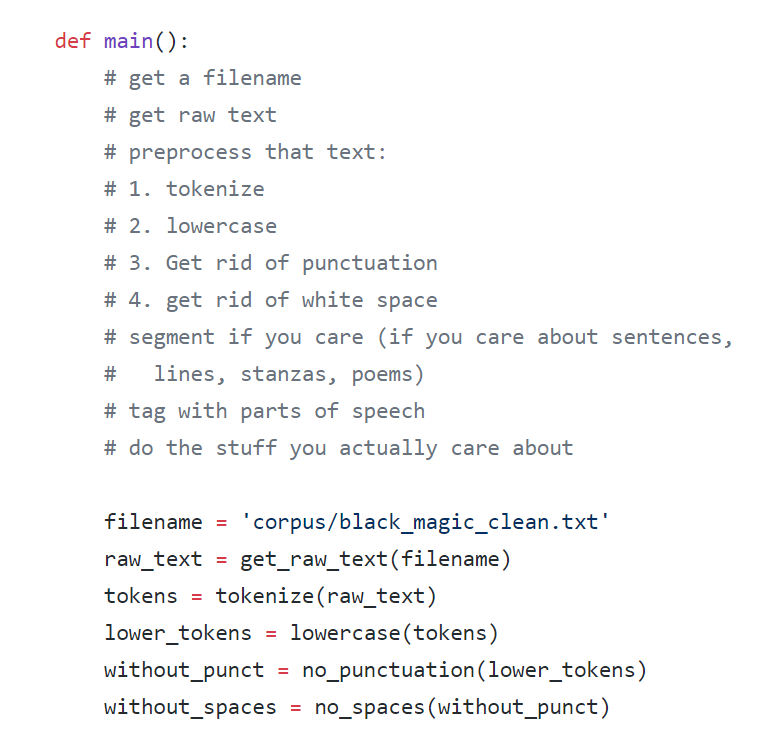 In this post I’ll discuss my initial foray into natural language processing (NLP)—cleaning up a corpus and prepping it for some basic text analysis techniques. I want to begin, however, with a note on the small textual corpus that I’m using in these preliminary explorations—Black Magic, a 1969 collection of three books of poetry by Amiri Baraka. We have awaited the coming of a natural phenomenon. Mystics and romantics, knowledgeable workers of the land. But none has come. (repeat) but none has come. Though startling, this final image punctuates a familiar narrative: the mounting of frustration, the boiling over of feeling while waiting and waiting for justice. The speaker’s closing remark seems to respond to the question asked in Langston Hughes’s poem “Harlem”—“What happens to a dream deferred?”—but raises the ante of the inquiry, and shifts from Hughes’s suggestive but still open-ended conclusion (“Or does it explode?”) to an unsettling direct request (“Will the machinegunners please step forward?”). The poem also, however, seems aware of its high dramatic tone: it conveys the gravity of this deferred deliverance with somewhat formal rhetoric like “We have awaited” and “But none has come”, but highlights—and perhaps undercuts—its own theatricality by embedding a stage direction in the poem, “(repeat)”. We’ve waited for long enough, the poem seems to argue, but stages this claim in such a way that the final line’s delivery hangs suspended somewhere between deadpan and dead serious. As a scholar interested in articulations of anger, resentment, and frustration with injustice—particularly injustice of a systemic and institutional nature—as well as digital methodologies, I thought these texts in particular might be worth looking at more closely with NLP techniques. As a graduate student working in a period that is almost entirely still in copyright, however, Black Magic also interested me because it is a small corpus of works—three books of poetry—to which I currently have access through UVA. Though conceptually unglamorous, basic questions of access have played an enormous role in determining the initial paths in my scholarly decision-making process. In this sense, though assembling workable data is always a challenge, scholars interested in literary texts prior to the early 20th century have more options for readily accessible textual corpora. For 20th- and 21st-century scholars interested in textual analysis, however, questions of copyright have made finding openly available textual data from which a corpus could be built an extremely difficult task: while able to share results of analyses through transformative, non-consumptive use, scholars of these periods cannot share the corpora from which these insights are drawn. This presents additional challenges in terms of reproducibility as well as in the already long, labor-intensive task of assembling, cleaning, and prepping a corpus prior to any actual application of NLP techniques. If texts aren’t already available as text files through a university or institution, they either have to be typed out by hand or scanned page by page, run through optical recognition software that transforms the page image into text, then also ultimately cleaned and corrected by hand. In short: no preexisting corpora means no experiments, prototypes, or conceptual ventures without surmounting certain barriers to entry that often prove time- or cost-prohibitive. To perform sentiment analysis on Sabotage, then, I first needed to get the raw text. By “raw text” I mean a big bag of all of Sabotage’s words. 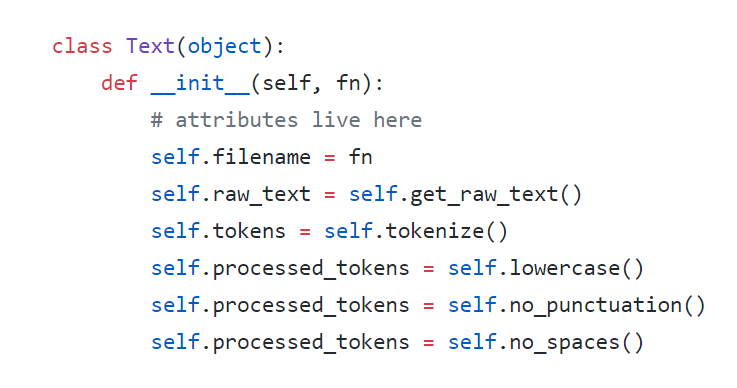 My goal initially was to get this bag of words with no line numbers, no punctuation, no capitalized first letters (otherwise Python would think they were two different words), and no spaces. As someone doing this work for the first time, I felt like I could handle writing a program that would remove capital letters, get the txt file into the correct file-type, maybe even get rid of the line numbers. But what about all this clutter surrounding the title of each poem? I considered how I might remove this with a program, but even something as small as irregular line breaks means the words would be chopped up in slightly different ways each time. Given the size of the corpus, I decided it would be wiser to remove the clutter by hand than to write a one-time program that automated it. With a huge assist from Brandon Walsh, cleaning up the rest of the text with the Natural Language Toolkit (NLTK) was relatively straightforward. 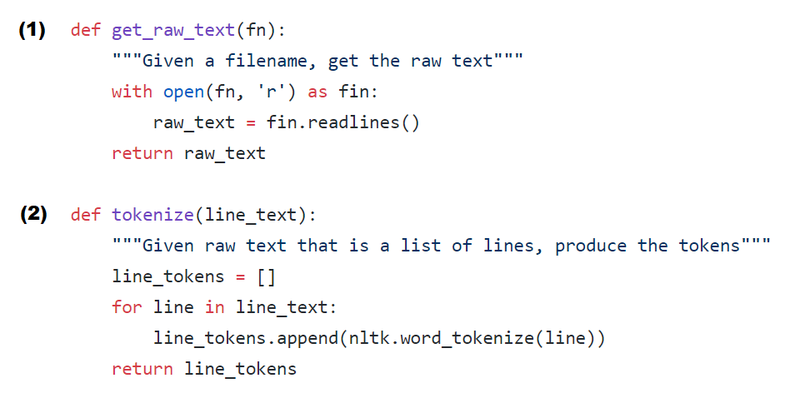 We wrote a small Python script that removed line numbers, then proceeded to write a script that would prep the clutter-free text files for text analysis, first by reading the text file as a list of lines (1), then by tokenizing that list of lines into a list of lists, where each sub-list is a list of the words that make up a line (2). While this may seem kind of complicated, certain kinds of text analysis need the lines to be tokenized in this way—much of the work then involves getting the text to be the right kind of data type (list of words, list of lists, etc.) for a given kind of analysis. Because I’m interested in sentiment analysis, I also needed to make every word lowercase (3), remove punctuation (4), and remove spaces (5). Though it gets the job done, this code is clunky. It represents, in short, the first steps in my learning how NLP works. And while not the most elegant in terms of form or function, writing steps out in this way was conceptually clear to me as someone trying them for the first time. I also want to add that throughout much of this Brandon and I were practicing something called pair programming, with Brandon at the keyboard (or “driving”) and me observing, asking questions, and discussing different ways of doing things. In addition to being an exciting scholarly investigation, this project is also a learning experience for me, and our code-decision-making process often reflects that. But more on the intricacies of collaboration later. To recap, at this point I had a series of functions that, in a linear, step-by-step fashion, took my original text file and began to play with them in Python’s working memory: it took Amiri Baraka’s poetry as one data type (a giant string of words) and turned it into another (a tokenized list of lists), with some changes along the way (like lowercasing and getting rid of punctuation). What made this so clunky, however, stemmed in large part from how I had organized my tasks: I gave Python basically only one thing to think about and work with at a time. It would take my corpus, W, and turn it into X, which it would then turn into Y, and then Z, and so on. But if I wanted Python to remember X while it was working on Z, I had to write code to turn Z back into X—in short, a data-type nightmare. Which sounds pretty abstract, but presented all kinds of practical problems. Finally “getting” object-oriented programming conceptually was truly a programming awakening for me, even if my initial attempts need some improvement—it hadn’t really made sense as an approach until I was faced with the problems it helps address. So we have the poems in all their fiery intensity, as well as the beginnings of actually using sentiment analysis as another way of thinking through them. As it currently stands, Brandon and I have started using TextBlob to perform some basic tasks—more on that soon. If you have any questions or want to follow along, my GitHub project repository can be found here. Cite this post: Ethan Reed. “First Steps with NLP and a Collection of Amiri Baraka's Poetry”. Published November 30, 2017. https://scholarslab.lib.virginia.edu/blog/first-steps-with-nlp-and-a-collection-of-amiri-barakas-poetry/. Accessed on .